Now- A-Team? Let the lawsuits fly. Erm... Really though, this card is garbage. Not even rentsy garbage, just garbage. There's a reason Jinzo exists, and it's so that we don't get normal rare monsters with horrible stats and effects that make even small children want to laugh. Seriously, if you have Harpie Girl and this in a draft, choose Harpie Girl. It will kill this and suicide with a Woodborg Inpachi. There's something good to be done with it. No running this card. Run Jinzo over it. Hell, run 7 Tools of the Bandit over it. 7 Tools is more rentsy. Honestly, Cory's mom- er, you will thank yourself. This is an interesting little monster. Its stats are nothing special - being LV2 even prevents him from becoming potential Metamorphosis food – but there is a nice effect that redeems him. He’s kind of like Maryokutai, but for Traps. Your opponent activates a Trap? Tribute this guy and negate it. Of course, your opponent won’t activate many crucial Traps if he knows you have something that can negate it, so he’ll probably either get rid of your A-Team himself or get you to waste it on less important Traps. Resultantly, it’s not that great. The best use I can see for this is in a Machine Deck. You can summon one, then use Machine Duplication to bring out the other two, thinning your deck and ensuring that your Limiter’d Machines will be able to attack without fear of Magic Cylinder or Sakuretsu Armor. Today’s card is A-Team: Trap Disposal Unit, an odd monster with Trap negation abilities. A-Team really isn’t a good monster. With 200 ATK and 400 DEF, it won’t be living for very long without some protection. Unfortunately, the effect doesn’t really help A-Team very much. 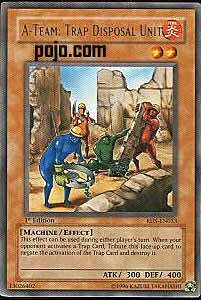 By offering A-Team as a Tribute you can negate the activation and effect of a Trap card and destroy it. The effect is a little rare for a monster due to the fact that it can be used during either players turn, but it isn’t enough to make A-Team a good card. Despite the possible usefulness of A-Team’s effect, there are better monsters that do a better job at negating Traps. Jinzo is an obvious example of a better monster, as are the numerous other Trap negating monsters released in RDS. Non-monster forms of Trap negation are also overall better than A-Team mainly because they don’t waste a summon. I like the effort that is being made to give us less broken forms of Trap negation, but the forms these alternatives are taking aren’t very appealing. Advanced Format: 1/5. There are quite a few superior alternatives. Traditional Format: 1/5. There are quite a few superior alternatives. Here we have the Maryokutai for Traps. I like Maryokutai better -- if playing stall, you had to use a Spell to kill the stall cards half the time, and Maryo provided decent protection. Personally, just stick to Scientist to yank out Senshi, or the new RDS cards that prevent Traps upon summon or Traps during the battle phase...or Jinzo. They really dropped the ball on this one. I know Konami is situated in Japan, but wouldn't a nice Mr T. picture have worked for this card's art? Anyways, everyone, check it out, it's another multi-trigger monster (oooh aaah). The game does not have many multi-trigger monsters, with Injection Fairy Lily and Strike Ninja being two of the more notable ones. A-Team is an interesting card. At face value, it's always a one for one trade because you'll be dumping a card of yours on the field for one on your opponent's side. But is it really a one for one trade? Or are there sinister variables left out of the equation? Let's think: Tributing A-Team for a trap card has a few drawbacks. One, you lose tempo, your normal summon. Two, a wiley opponent wouldn't activate a trap when A-Team is on the field, instead opting to bring out a monster and smack you for 1000+ plus next turn. So A-Team will only be able to use his effect when you're in a game-winning situation, and the opponent HAS to use his trap to prevent lifepoints from going down to zero. This actually makes A-Team worthless, or at the very least only usable in decks that use Level Limit Area B and other such stall cards. In that case, why would you use him? Burners/Stalls don't have many traps to fear. Sadly enough, A-Team proves to be nearly worthless. In my opinion, he should have been a Level 3/4 monster with far higher stats. And finally, to those who want to combo this card with the new RDS card, Machine Duplication, don't even think about it. The disadvantages of running 3 or 2 of each far outweigh the advantages of getting 3 on the field. one for one trade. Note: If the best possible use of a card is a one for one trade, as opposed to consistently being one for one in and of itself like Smashing Ground, the card is probably not very good. Best Draw for the Situation: Let's be honest here. What kind of player would activate a trap when a 300 attack monster is on the field, provided they have enough life points? (You start with 8000). Wouldn't you just wait for the next turn where a Gorilla could smack it for 1700? Unless you're wasting special summons on A-Team, he's probably never going to be useful. Attributes/Effect: He's a fire machine which makes him both worthless for Chaos and useless with Limiter Removal. His stats are 300/400. You'll likely never be able to use his effect. Oh yeah, he's also a worthless level 2. Any questions? Dependability: You'll be running this guy to negate traps. You won't ever negate a trap with him versus a good opponent, unless you have a Black Luster Soldier and you're about to attack for game.